This was an amazing evening, and we thank all our guests and supporters for making the fundraiser a super success! Adoption Options has teamed up with Canadian country music star Bobby Wills to create an intimate charity fundraising event you don’t want to miss! As an Ambassador for the Adoption Council of Canada, Bobby is committed to educate and raise awareness of adoption. He will sing his hits, introduce new music and share his personal experiences in the world of adoption. There will be a fantastic Silent Auction supporting Adoption Options, raising funds for our continued work placing kids in their forever homes. Delicious appetizers provided by Simply Elegant. We are so grateful to our corporate sponsors for their generosity in making this event a fundraising success! Thank you to everyone who participated in 8th annual Spread the Love fundraiser in support of Adoption Options! We did things a little differently this year with an online auction, giving an opportunity for our Adoption Options’ families and friends throughout the province to participate. Contact Lisa at lvoytechek@live.ca with your donation ideas and items, and she will take care of all the details. You can watch the inventory grow at www.elevateauctions.com/AdoptionOptionsSTL. Tell your family and friends about the online auction. Spread the Word far and wide! Give them the website address to view items in advance and bid starting May 15th. The more people that know about it, the greater the success of this fundraiser. And while you spreading the word, you are raising awareness of Adoption Options at the same time! Don't miss out! Starting May 15th you can bid to win your favourite items. 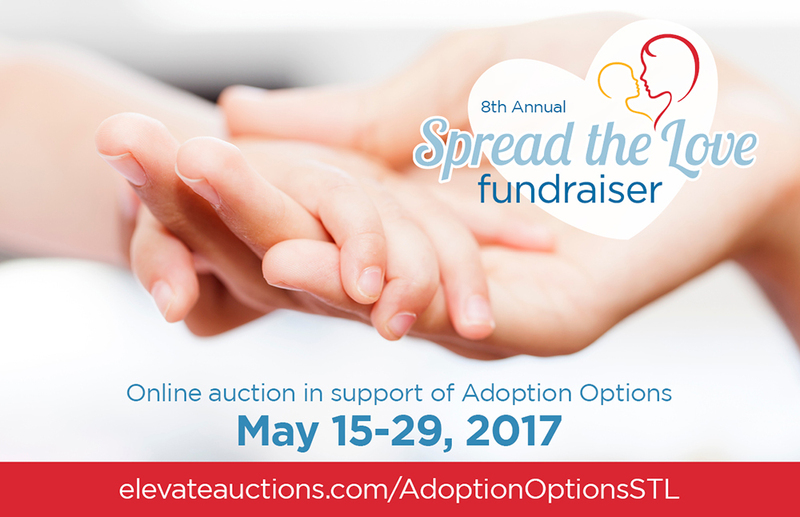 Every bid supports our efforts to raise awareness of open adoption and the services Adoption Options offers. Remember to enter your final bids on May 29th before closing time! For more information and to view auction items, visit the Spread the Love Online Auction website often! If you would like to make a cash donation to this fundraiser, please click here to be redirected to our donations site. Huge thanks to Lisa and Jason Voytechek for planning, organizing and making this fundraiser a reality! We couldn’t do it without them… and without all of you! What is Spread the Love? Once a year, members of the adoption circle come together to celebrate the work of Adoption Options and raise money for its ongoing outreach efforts. The event is called Spread the Love and for the past 7 years it has been generously hosted by Theatre Calgary. Attendees have seen dress rehearsal productions of The Little Prince - The Musical, Beyond Eden, A Christmas Carol, Much Ado About Nothing, Pride & Prejudice, Major Barbara, and the Philadelphia Story. Spread the Love was founded by adoptive parents Bruce Sellery and Dennis Garnhum in 2010 in response to a pressing need for additional funds at the agency. To date the event has raised over $130,000 thanks to the generosity of adoptive families, waiting families, birth families, their family and friends, and corporate sponsors. We were thrilled to once again be hosted by Theatre Calgary for our 2016 Spread the Love fundraiser. And doubly thrilled that our guests were among the very first to experience this World Premier of the family musical, The Little Prince, based on the beloved book by Antoine de Saint-Exupéry, adapted by Nicholas Lloyd Webber and James D. Reid. The evening included a light meal, silent auction, door prizes and a sneak-peak preview of this live theatrical performance. We had record-breaking numbers attend the 7th annual Spread the Love evening. Unplanned Pregnancy: The Power of Open Adoption, thanks to the incredible volunteer production and editing duo of Steve Dierkens and Joe Kelly, and four amazing birthmoms who shared so openly and honestly.